Who drives two-plus hours to read three pages of FRANKENSTEIN aloud? 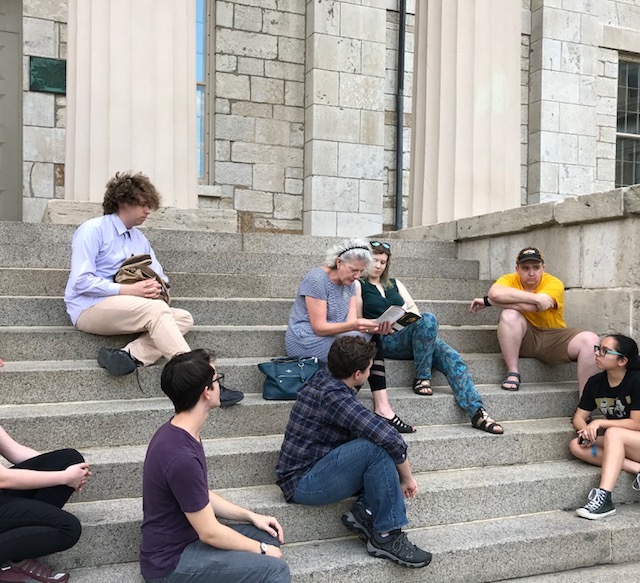 Part of Iowa City’s annual Book Festival (tenth annual this year for the UNESCO City of Literature) was a continuous reading of Mary Shelley’s famous novel. Other events were a panel discussion at the public library and screenings of “Frankenstein” and “Bride of Frankenstein” at FilmScene, Iowa City’s art house cinema, where my daughter Rebecca is Programming Director. I learned about the public reading only a couple of days ahead of time. When I signed up, only one slot—the final one—was left. As I drove from Winterset, I advised myself against disappointment should the reading conclude before I got there. I need not have worried. The brilliant Anna Barker, experienced in such things, monitored readers all day long (from 9 a.m. to almost 6) so everyone had a turn. Around 5 p.m., the little group, clustered on the stone steps of the Old Capitol building in a hot, punishing wind, edged the narrative ever closer to its dramatic conclusion—the unnamed Creature’s final pathos-drenched polemic, his indictment of Victor Frankenstein, the man who gave him life but didn’t bother to give him a name. The second-to-last reader, seated at my left, handed over the book just a handful of paragraphs shy of the final sentence. As I read the words nineteen-year-old Mary Wollstonecraft Shelley put in the mouth of the soon-to-suicide Creature, I felt my voice shake with emotion. An hour later, I was at the library for the panel discussion. Interesting enough, its focus was on the authors (Milton, Plutarch, Goethe), the Creature reads in the formative months following his catastrophic birth. As I listened, though, I wished the conversation had instead focused on Mary, the teenager who created the character (Victor Frankenstein) who in turn built the nameless monster. Of greater interest—to anyone I would think—is how this girl (the best-read woman in London at the time), with a young child at her side and pregnant with another, managed to produce, in nine months, the work she later called her “hideous progeny.” After all, without Mary, where is FRANKENSTEIN? Having spent years studying Mary and the life she herself described as disastrous, I’m biased of course. Stay tuned for my own progeny, my novel MY LIFE WITH SHELLEY, hopefully to be published soon, Within my book’s pages, Mary lives! I can hardly wait to read the book! I can hardly wait to read your book!